Hall-of-Fame Coach Mike Ditka likes to say wisdom is rarely wasted on the young. Operative word in that thought: rarely. This, the inaugural release from the young barsmiths Justin Smith & Ben Rasmussen at Potomac Chocolate, flirts with brilliance before descending into the dim afterglow of its own shadows. Just lucky or genius? Maybe lucky geniuses. distant shades of De Vries (mangosteen / grape / tamarind seed in a generalized balsamic tang) quickly shifts to juju raisin beads before a unique signatures arises: mother-of-pearl overlay, then alabaster & finally ivory soap bubbles!! Sound the alarms or ring the bells? Rogue opening (Colin Gasko’s quasi-Piura raspberry riot) then, alas, closes with an Amano-peel out (the dashed promise of Art Pollard’s Jembrana). In between some good cocoa flush. 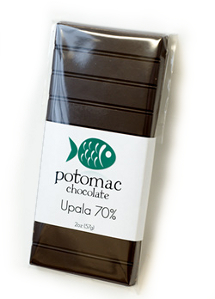 Ultimately a teaser chocolate: the bean runs out of stamina & flattens toward the finish. The mix of flavors points away from conventional Costa Rican cacáo trees & in the direction of CATIE – that country’s research center & one of the 2 main genebanks in the world. The stuff of fabricated pedigree... new stocks concocting a functional hybrid engineered for yield, disease resistance & a drop of ‘fine-flavor’ veneer. Potomac handles it fairly; lowers the temp on the oven roaster compared to the burn-marks in this bar’s 82% sibling (a judicious choice), offset by an excessive conche (noticeable in the taut Texture & collapsed progression). Results in a listless though not necessarily lifeless chocolate. A bar whose character goes wandering in search of itself.